Our North East Regional Final would consist of 155 players. These players would be playing for a share of £1000 and six National Final places. Two players from the final table would leave slightly disappointed at missing out on a place in next years National Final, but they would receive a small cash prize for their efforts. John Wardle and Paul McFarlane would be the unlucky two players on this occasion but time is still on their side. A heads-up match between Chris Peers from the Eagle in Stockton-on-Tees and Steve Embleton from DL5 in Newton Aycliffe would commence after Brent Allen’s elimination in 3rd place. The final hand saw Chris receive the luck he needed as his 9h6s outdrew Steve’s Ad5h on a Kc7h6h 6d 4c board. 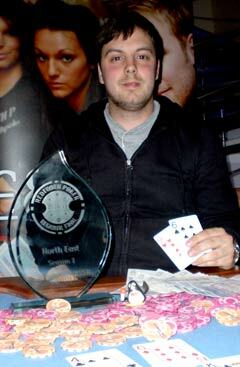 Chris receives £500, a Redtooth trophy and a seat in next years National Final.